Happy Halloween readers! Have a safe and fun Halloween! As much as I'd like to not have any more birthdays and not get any closer to 30 (ahhh! ), I would love to have a cupcake party for my birthday this year. My birthday is only a few weeks away (November 19) and I would love to put together a cupcake party. I thought about doing this last year, but I just didn't get around to it. That's the problem with having a birthday during "the holidays." I think I can pull this off! Happy future birthday to me! 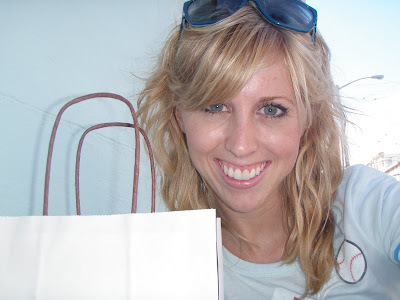 Toni, a reader from Tennessee, recently posted on her blog about Girl Gourmet Cupcake Maker. I had never heard of this toy, probably because I don't have any kids yet. Girl Gourmet is the modern version of an Easy Bake Oven, but you end up with cupcakes instead of a cake. I'm liking the sound of this so far. Sadly, Toni said that the toy is not worth the money. The $20 kit she bought only made two cupcakes! That makes those cupcakes pretty expensive. My suggestion: buy Betty Crocker's Warm Delights. Same idea...you get a bowl and ingredients. You mix the ingredients and microwave. Result: a pretty yummy chocolate cake (or cinnamon swirl cake or brownie or cookie) at a way cheaper price (around $3). Buy a tub of frosting for $1.50 and you're still way under budget. Thanks for the post Toni! Check out her whole story here. Duncan Hines' website has some great Halloween-inspired cupcake recipes using Duncan Hines cake mix and frosting. The cream cheese filling in the middle of these Devil's food "Spooky Surprise Cupcakes" looks delicious! You can also check out other Halloween cupcake recipes and decorating ideas from Duncan Hines that come from their partnership with best-selling cookbook "Hello, Cupcake!". See the pictures and recipes here. Even though it's not a cupcake, this Pumpkin Spice Cake is too cute! Nice touch of adding the ice cream cone in the middle of the cake for the pumpkin stem. Oh, did I forget to mention? I met Rachel from Cupcakes Take The Cake at the Mini Cupcake Clash in San Francisco! Talk about a huge deal! Cupcakes Take The Cake is only the biggest cupcake blog around. They are based out of New York, which explains why I've never met Rachel before. It was a pretty cool experience and I can't wait to hang out again. She mentioned a possible cupcake meet-up in LA before the end of the year. Let's hope it happens! Funny, but I'm not the first in my family to meet Rachel. As you may recall, my husband, Skyler, first met Rachel in Chicago. Skyler may not be aware, but he is as much of a cupcake activist as I am! We've met the winners, seen Teams #1-8 and Teams #9-15, now let's meet the rest of the competitors. Team #16: Sweetiecups "La Vie en Brie"
This cupcake was a fresh pear cake frosted with whipped brie cream, decorated with pieces of walnut and pear. I wasn't sure if I would enjoy the whipped brie cream, but it was surprisingly good. I got the chance to talk to Doro, the owner of Sweetiecups. Her cupcakes differ from traditional cupcakes by incorporating her German roots. I finally got to try my first bacon cupcake! This cupcake was also another organic cupcake. This cupcake tasted like a mixture of my favorite breakfast items: pancakes, eggs, syrup, and bacon. I decided that I like bacon cupcakes! Team #18: The Muffin Tops "Mocha Mania"
This was the youngest team. These two girls, Clare and Eve, are 12-years old! And they made a pretty decent cupcake. This was their first cupcake competition and they did a great job! Team #19: Nali Cupcakes "Bombay Elvis"
Team #20: Full Windsor "Sparkling Fruit Cupcakes"
Champagne Pear Cupcakes and Grand Marnier frosting with goat cheese. Goat cheese in the frosting? Interesting. I'm always excited to try something new! Team #21: Cinnaholic Sweets "Blueberry Dragon Fruit Chocolate Ganache Cakes"
This team was also another big winner. They won the award for Photog's Choice and Judges 1st Place. This was the first cupcake I tried and I was very impressed. Team #22: Corpulent Confections "Whatever: A Vegan Creamsicle Experience"
The judges did a great job at picking the some of the best cupcakes. Their picks were also some of my favorites. But what was my favorite cupcake? I had a hard time picking my favorite because I wasn't sure what criteria to base my choice on. Would it be a cupcake that was unique? A cupcake that I could eat every day? The sweetest? I made my choice, but you might be surprised to hear that it did not win any awards. My favorite was the Sparkling Fruit Cupcake made by Team #20. I can't even believe that I chose a pear cupcake with goat cheese! I really liked the blend of flavors. Congrats to Team Full Windsor! What a day! SF Food Wars Mini Cupcake Clash lived up to my expectations of a great event. I got to eat some of my favorites and also got to try some new cupcake flavors! The event was very organized and I had a great time meeting some cool people in the cupcake world. You've already seen the winners and Teams #1-8. Let's meet Teams #9-15. Team #9: Little Miss Muffin "Tiny Treasures"
Traditional red velvet mini cupcakes. Team #10: Yahtzee, B****cakes! "Tossed Salad (Dressing)"
I was very nervous to try this cupcake. It was another non-sweet cupcake. Surprisingly, it wasn't bad like I thought I would be. The cake part was a little drier than normal, which made it more like a piece of bread. The dressing was made with balsamic vinegar. So the pairing of the two was like dipping a piece of bread in vinegar. Interesting idea, but not quite a cupcake in my eyes. Team #11: Hella Fat "My Grandma's Bananas"
Another big winner team! This cupcake won two awards: People's Choice and Judges 2nd Place. I was in line with the attendees and judges and loved this cupcake! Team #12: Small But Mighty "Strawberry Extra-Shortcake"
This was my personal third favorite cupcake from this event. Vanilla cupcakes with sugar glazed on top with a small blowtorch, topped with strawberries and chocolate swirl. Oh! And there was a chocolate filling in the middle. Yummy! Team #13: FTW "Vampire Bites"
Frosting made with Sriacha. Not sure how I feel about spicy with a sweet cupcake. Team #14: The City Zingers "Lemon Twist"
Team #15: The Dynotologists "Green Tea Cupcakes of Glory"
I got the chance to talk to many of the other attendees. I met Craig and Kevin and we debated on whether savory cupcakes were really cupcakes. It was fun to be able to talk cupcakes with so many people. Welcome to SF Food Wars: Mini Cupcake Clash! I attended this fabulous event about a week ago (October 18, 2009) in San Francisco, CA. This was the first large cupcake contest that I've attended. I had a blast! And despite eating enough cupcakes to make me feel sick, I was still craving more that night. Go figure! I've already posted the details and the winners of this event on a previous post. This post, along with the next few posts, highlights all of the twenty-two entrants. Team #1: Zaftig Sweets "So What Spiced Mocha"
Sadly, this was my least favorite cupcake. I generally don't enjoy vegan cupcakes (although you might see that my opinion changes --hint, hint--). Team #2: Team Mustache "Guinness Gasm"
My hubby and I both liked these. Almost exactly like the Irish Car Bomb cupcakes my friend Dave made for St. Patrick's Day. Great aftertaste. Team #3: Baby Bites "Bacon & Chive Poppers"
Team #4: Team Chomp "Viva Churrito!" One of my husband's favorites! These cupcakes had a homemade churro chip on top. Pretty good! Team #5: Double the Yum! "It's Peanut Butter Jelly Time!" These cupcakes won the award for People's Choice Honorable Mention (for close-up photo see previous post). And in case you didn't notice, these girls are twins! Team #6: Team Pound "Fromage et Trois"
Team #7: Team TimeCube "Autumn Apple"
I can't remember trying an apple cupcake before this, but why not? Two of my favorite foods put together! Even more interesting is the type of apple used: Gravenstein. I had never tried or even heard of this type of apple. After eating this cupcake, I need to find those apples! This was the second place winner for my favorite cupcake. The frosting was definitely the best of all of the cupcakes. The little bit of caramel on top really made the cupcake. Delicious! Team #8: Mission Minis "Cinnamon Horchata"
These cupcakes won the award for Judges 3rd place. I got the chance to talk to Brandon Arnovick, the owner of Mission Minis. It sounds like his cupcake company is doing really well. You can buy his cupcakes at many coffee shops, yogurt shops, delis, and Whole Foods in the San Francisco area. You know his cupcakes have to be good if they are being sold at Whole Foods! His cupcake was another one of my top favorites for the day. The frosting was perfect, which is something that is so important for a cupcake. 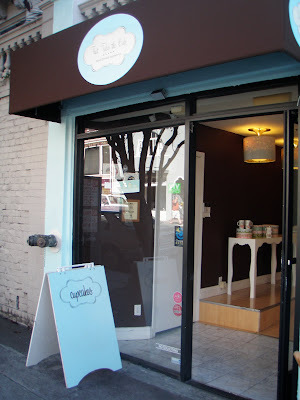 When I booked my trip to San Francisco last month, I expected to visit a few cupcake shops during my stay. Imagine my surprise when I found out that my trip was going to coincide with SF Food Wars: Mini Cupcake Clash! SF Food wars explains this event best: "The Mini Cupcake Clash will pin 20 home and professional baking masterminds against each other as they present their miniature morsels of one-bite goodness." 170 people purchased tickets ($10 each) to gain entrance into the event and got to sample all of the mini cupcakes. Sounds like a win-win situation for the bakers and eaters. 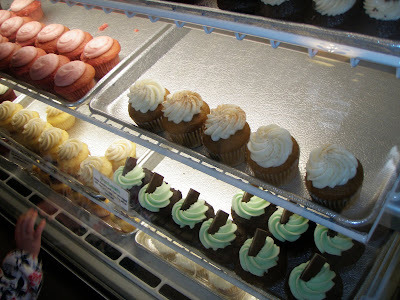 The Mini Cupcake Clash took place at the Stable Cafe in San Francisco on October 18, 2009. The guests lined the streets as 1:00pm approached. Lucky for me and my husband, we got to bypass the line with our press passes. The event turned out to be a pretty big deal. There were fancy cameras everywhere and even a TV crew! And now onto the judges picks, the big winners of the event. There were three judges: Tamara Palmer from SFoodie, Jen Musty of Batter Bakery, and Steve Gdula of Gobba Gobba Hey. Sound familiar? Yes, They also won the Photog's Choice award. Their cupcakes were beautiful and great-tasting. They had the complete package, a perfect cupcake. This team also was chosen for the People's Choice award. They must be doing something right with their cupcakes! To check out more coverage of this event, look here, here, here, and here. I will be posting more about this event over the next few days. Check back often to see the other cupcakes and to see if my favorite cupcake won! One cupcake shop down, one more to go. Continuing with my cupcake excursion, I excitedly walked to the Union Street Shopping District to find That Takes the Cake. 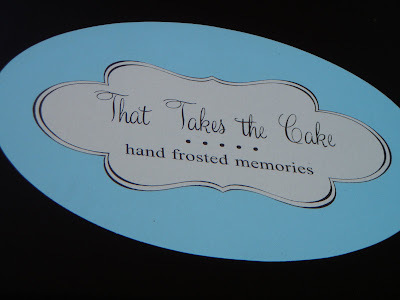 That Takes the Cake had a pretty decent variety of flavors, mostly what you would expect at any cupcakery. Their cupcakes were large, but they also had a few mini cupcakes to choose from. I decided to enjoy this beautiful, sunny San Francisco day by eating my cupcakes at the outdoor seating of That Takes The Cake. The location was perfect for people watching. I didn't get the pumpkin spice from Kara's Cupcakes because of the choice of flavors, but I really wanted one. 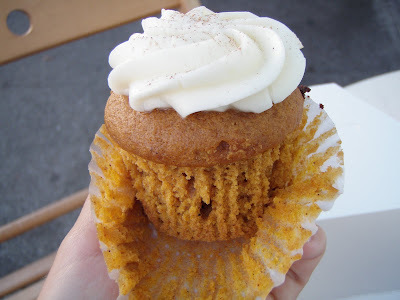 I was so happy to see that That Takes The Cake had a Pumpkin Spice cupcake to satisfy my craving. The Pumpkin Spice was exactly what I expected it to be. Moist pumpkin cupcake with creamy cream cheese frosting. I love autumn and the yummy pumpkin desserts that come with it! 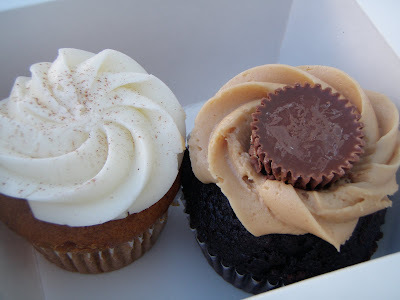 My second choice was a chocolate and peanut butter cupcake called Opposites Attract. Like I've mentioned a million times before, chocolate and peanut butter should get married because they go together so well. The frosting was a very creamy peanut butter frosting. The cupcake was topped with a mini Reese's peanut butter cup, which was very appropriate since the cupcake was pretty much a Reese's in cupcake form. I loved it! Although I was getting pretty full from all of the cupcakes I had eaten that day, I made room for one more mini Red Velvet cupcake. The cream cheese frosting had a good thickness, but there could have been a little more frosting to be proportionally correct. Otherwise, this cupcake was great! Funny side note: My husband asked why the wrapper is always partially pulled off when I take pictures of cupcakes. I figured out why. I get so excited to eat the cupcakes that my first impulse is to start eating. Suddenly I remember that I need to take pictures of the cupcakes first. Hence, the wrapper is partially removed. Sometimes I even go as far as to start eating the cupcake. Thank you to everyone who recommended this cupcake shop to me. That Takes The Cake lived up to its hype! 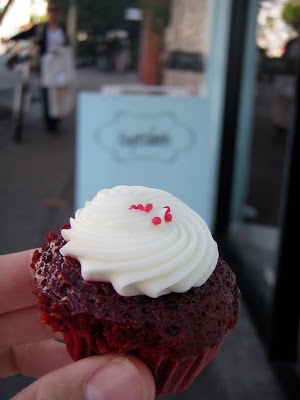 After indulging in these cupcakes, I certainly needed the two mile walk back to my friend's apartment.